Here is a link to my article on Tesla, published on TheStreet this morning. The last five trading days saw the S&P 500 index make some wide intraday swings but the opening and closing price ranges were relatively narrow. 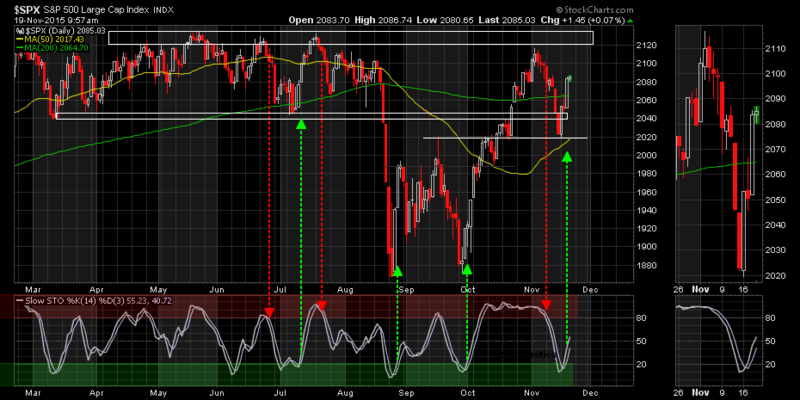 During this period of range compression a series of high wick candles have formed on the daily chart. These candles reflect an inability to hold higher levels and are a sign that price momentum has stalled, and further consolidation or a pullback may be required before a continuation of the primary trend. 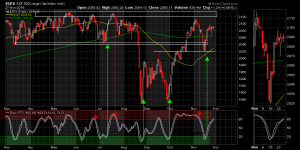 As we have been saying for some time, the stochastics oscillator has been an accurate indicator of oversold and overbought shifts in the index. 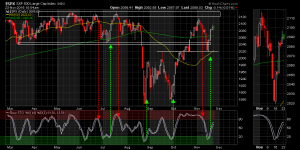 It has reentered its overbought zone and combined with the appearance of the high wick candles, requires very close attention at this point. 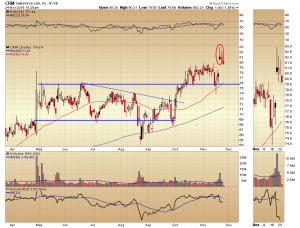 Here is a link to my article on Kohls (KSS) published on TheStreet this morning. 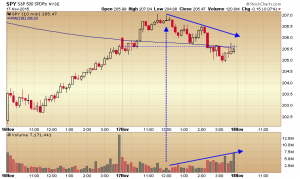 A Tri-Star candle pattern has formed on the Salesforce.con (CRM) daily chart. 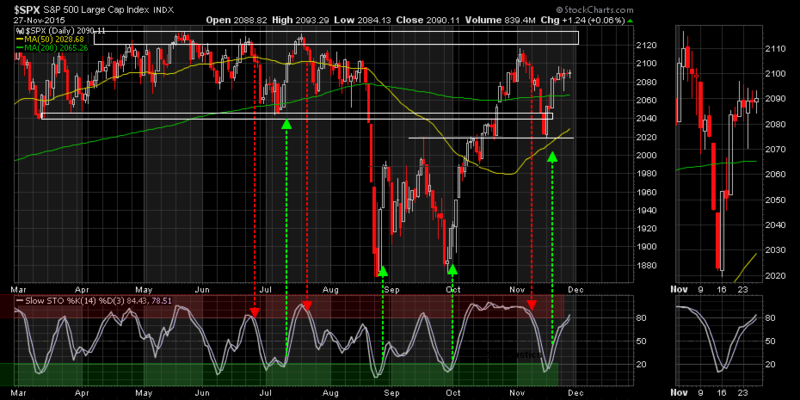 This is a rare formation consisting of three consecutive doji candles that follow a protracted trending period. 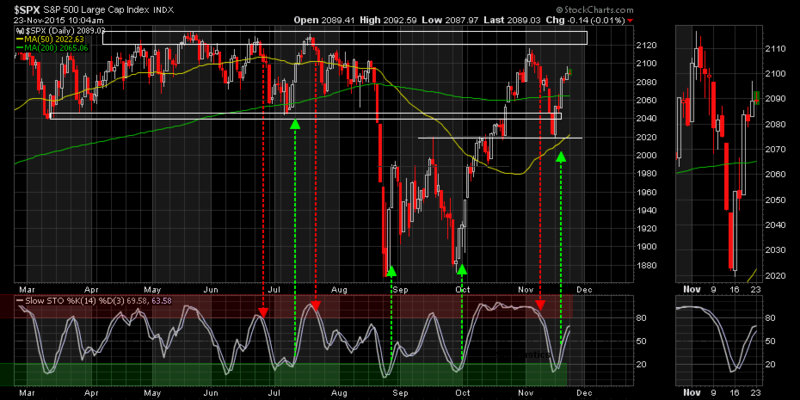 The doji candle has a narrow opening and closing range and often a high wick, and represents market indecision. In the case of CRM, the TriStar is a bearish reversal signal, but like all individual candles of candle patterns requires confirmation. Here’s a link to my article on Whirlpool (WHR) published on TheStreet this morning. 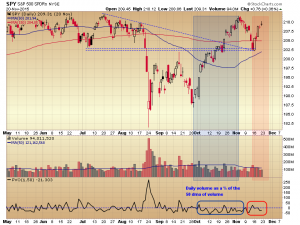 The divergence between higher price and confirming volume levels continues, with Friday’s gain in the S&P 500 SPDR (SPY) coming on volume that was 21% less than the 50 day moving average of volume. The rally in October saw similar anemic levels of participation, but of course that was of little concern to those who were invested in the broader market. 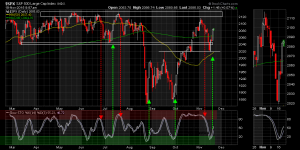 Price is the final arbiter and trumps volume readings, oscillators and indicators, and analyst expectations. Questions do remain: If the major indices are able to continue to advance and eventually breakout to new highs, will the capital that has been on the sidelines commit? 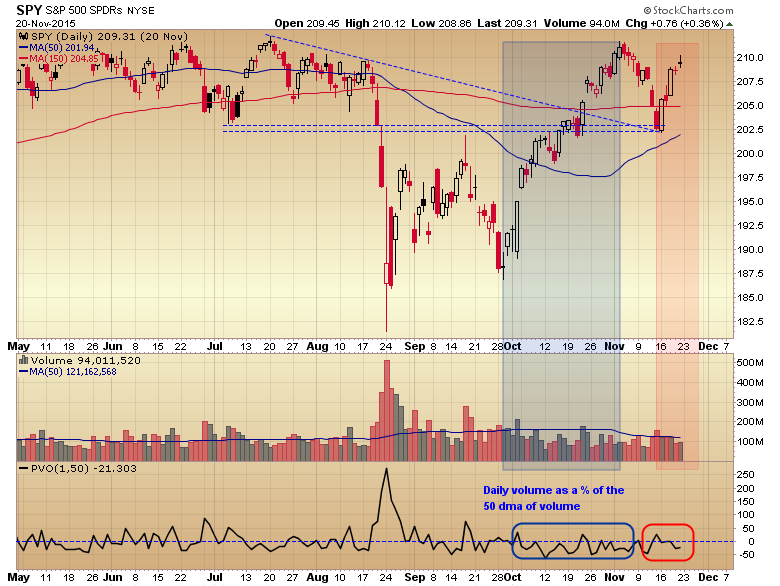 ; will those who benefited from the rally take profits at that point and wait for a pullback to reenter? 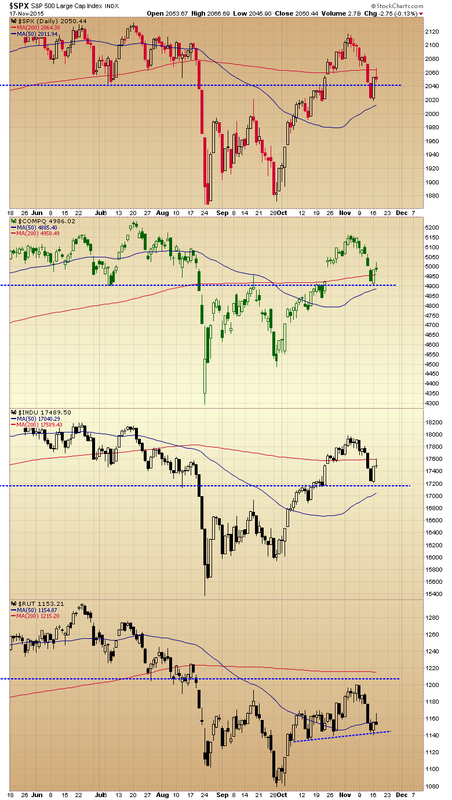 Here is a link to my analysis of the Ambarella (AMBA) chart published on The Street this morning. The close in the S&P 500 index last Friday was on the low and just above the September high support level which, followed by the events in Paris over the weekend, suggested a breach of support and a lower open on Monday. 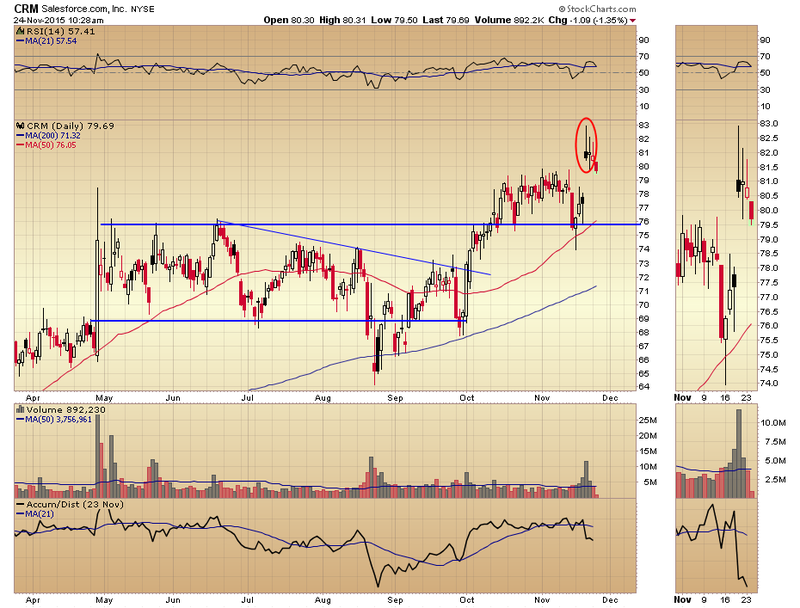 That was not the case, and in fact the support line held and a large bullish engulfing candle formed which took the index back into the horizontal channel range it had been trading in earlier in the year. 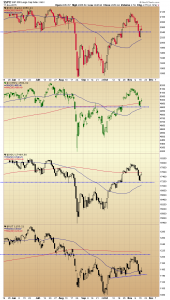 There was positive follow-through action in the Tuesday morning session, but after the index penetrated its 200 day moving average around noon, it quickly reversed direction closing near its low and creating a bearish high wick candle. The negative implications of Tuesday’s candle had no effect on Wednesday’s session and the broader market saw a strong rally and a close near the highs of the day. At this point in the trading week the S&P 500 index is positioned squarely in the center of the March through August channel range. The market was higher early in Tuesday’s session building on Monday’s gains, but that momentum shifted dramatically around noon. 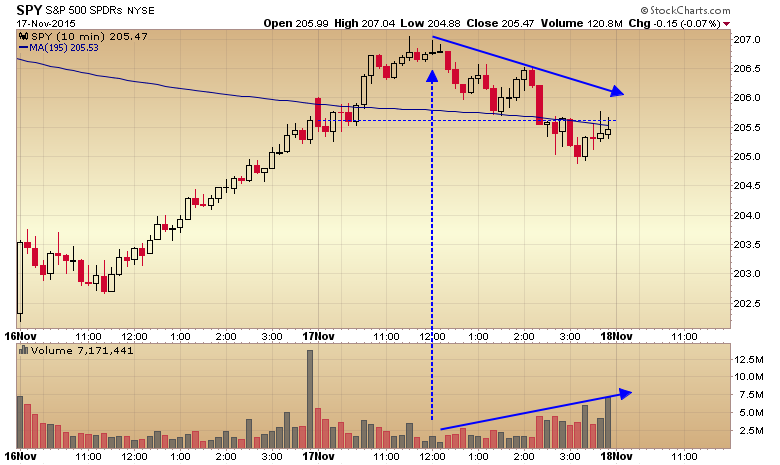 The ten minute S&P 500 SPDR (SPY) chart shows the decline in price and an increase in volume that began midday. Here is a link to my article on Splunk (SPLK), published on “The Street” this morning.